This study examines how hunger narratives and performances contribute to a reconsideration of neglected or prohibited domains of thinking which only a full confrontation with the body’s heterogeneity and plasticity can reveal. From literary motif or psychosomatic symptom to revolutionary gesture or existential malady, the double crux of hunger and disgust is a powerful force which can define the experience of embodiment. Kafka’s fable of the "Hunger Artist" offers a matrix for the fast, while its surprising last-page revelation introduces disgust as a correlative of abstinence, conscious or otherwise. Grounded in Kristeva’s theory of abjection, the figure of the fraught body lurking at the heart of the negative grotesque gathers precision throughout this study, where it is employed in a widening series of contexts: suicide through overeating, starvation as self-performance or political resistance, the teratological versus the totalitarian, the anorexic harboring of death. In the process, writers and artists as diverse as Herman Melville, Percy Bysshe Shelley, Christina Rossetti, George Orwell, Knut Hamsun, J.M. Coetzee, Cindy Sherman, Pieter Breughel, Marina Abramovic, David Nebreda, Paul McCarthy, and others are brought into the discussion. 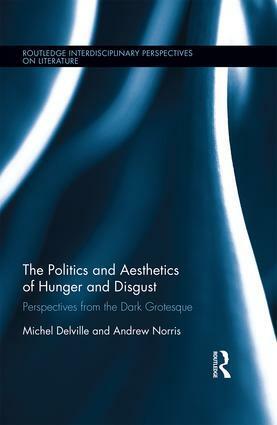 By looking at the different acts of visceral, affective, and ideological resistance performed by the starving body, this book intensifies the relationship between hunger and disgust studies while offering insight into the modalities of the "dark grotesque" which inform the aesthetics and politics of hunger. It will be of value to anyone interested in the culture, politics, and subjectivity of embodiment, and scholars working within the fields of disgust studies, food studies, literary studies, cultural theory, and media studies. Michel Delville is Professor in the Department of Modern Languages and Literatures at the University of Liège, Belgium. Andrew Norris is Senior Lecturer at the Université Libre de Bruxelles, Belgium.